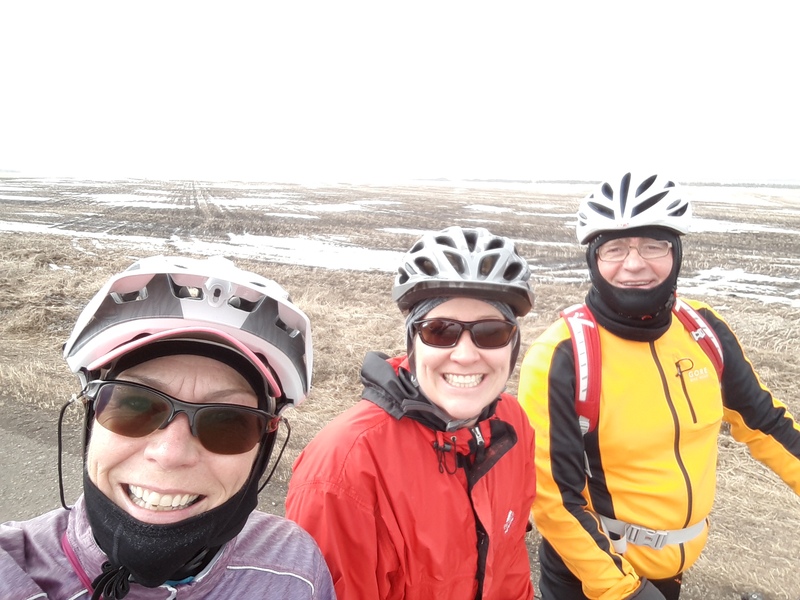 April 4 … watch the events calendar for details of this and other rides. I frequently get asked, “What bike should I buy, Don?” If I only knew what to tell you… There is so much to consider. There are so many choices in today’s world, at so many prices, with so many features, that there’s just no exact answer. This is how I see the bike world at the moment. The first thing to consider is what type or style of cycling do you anticipate doing the most of? Road Biking? Mountain biking? Touring? Racing? Recreational jaunts with others? Any bicycle will do most of these things to some extent but selecting the right bike for a particular job will make it more enjoyable. It’s possible to tour on a racing bike, or race on a touring bike, but the person sitting on the bike made for the job at hand will be happier than the person on the saddle of a bike doing a job it wasn’t primarily designed for. Novice cyclists need to decide on what is the PRIMARY type of riding they’ll be doing and then buy the bike best suited for that job. A second bike can be considered later if interests change. Most members of EBTC will want some sort of bicycle that performs well on paved roads, is fairly lightweight and will carry a few things to get them through the day. In my opinion, what’s commonly called a “sport/leisure” bike will be the bike of choice for them. If they later decide to go on extended tours and carry all their supplies and equipment with them, they might consider buying an actual “touring” bike. If they decide that off-road cycling is their preferred choice then they will want to get a “mountain bike.” Establish a price-point for yourself before going shopping and stick with it. Categorizing bikes isn’t easy, there are so many subtle distinctions between types. A “Road bike” can be a racing bike, a touring bike, a sport/leisure bike, a comfort bike, a tandem, a cruiser, or some other type of bike. A “Mountain bike” can be a cross-country bike, a downhill bike, and maybe even a BMX bike falls into this class. There are even “between” types of bikes such as “hybrids,” (they look like a light-weight mountain bike); “cyclocross,” (bikes that look like a road bike but are ridden in the dirt like a mountain bike); and recumbent bikes that are low to the ground and the pedals are way out in front. Looking like a racing bike, these bikes are just what EBTC members frequently select as their bike of choice. They weigh a bit more than a racing bike (having less exotic parts) but they are less expensive and easier to handle. They can be fitted with a rear rack (by any good bike shop) to carry a day’s clothing and snacks. They are usually fitted with a triple chainring, providing anywhere from 24 to 30 gear selections, making them suitable for getting anyone easily over all hills and up mountains. Prices range from $700.00 to $2,500 depending on frame materials and component quality. Many fine aluminum-framed bikes with a quality 27-geardrive train were available in Edmonton last year(Ed. Note: 2004) for under $2,000. These bikes are fun to ride, quick and efficient. They excel on day trips, covering the ground with minimum effort while providing a feeling of comfort. Weighing around 20 pounds, their relatively light weight makes for easy hill climbing and they can be nearly as fast as an outright racing bike if and when you decide to mix it up with your friends. They are sturdy enough to carry a few extra pounds of kit. They do have some limitations. They are a poor choice for city riding, as their wheels are too fragile to repeatedly hammer into curbs and potholes. They can’t be fitted with panniers. They are difficult to control in gravel or dirt but very few club road trips encounter these conditions. At first glance a “touring bike” also resembles a racing bike but a quick inspection will show the difference. Touring bikes are designed to carry a heavy load. This might include two or even four panniers loaded with all the equipment required for an extended trip, including sleeping apparel, stoves, clothing, and food. They will have special “braze-ons” to mount fenders and carrying racks, front and rear. Often they will have three water-bottle mounts. Their wheels have extra spokes for added strength and the tires will be wider. They are a bit lower for stability and are slightly longer to provide a bit more space for fenders. This added length also tends to make them travel straighter for better control of the heavier load and creates a softer, more comfortable ride than the shorter sport bikes mentioned above. Triple chainrings are standard equipment on touring bikes, providing a full range of gears that will make it possible to climb huge hills or take advantage of strong tailwinds. Touring bikes are readily available in Edmonton, made by Cannondale, Guru, Trek, Marinoni, Giant, Bianchi and others. In 2004, prices ranged from $900.00 to $2,000 in Edmonton shops. A touring bike is a necessity for fully loaded touring. These bikes are also very suited to in-city riding and commuting, especially if fitted with wide and sturdy tires. On the other hand, in my opinion, they are too heavy and sluggish for those who anticipate they will be riding only day trips and short, light jaunts. They are more bike than needed for casual riding and van-supported day trips. As the name suggests, a “hybrid” bike is a blend of a couple of other types, having characteristics of both a road and a mountain bike plus a bit of its own personality thrown in as well. These bikes were created for riding in the city, and work best in that role. Their frame geometry is a bit more upright than both road and mountain bikes, giving a great view of traffic. The wheels are sturdy enough to take potholes and curbs. The tires are wide enough for comfortable riding over gravel and they resist glass cuts but are not as fat and knobby as a pure mountain bike tire. Fittings are provided for mounting a carrying rack. The handlebars are flat and wide, giving good control and handling. Not as heavy as a pure mountain bike they are great for commuting or running errands. Their upright position makes them appealing to those with back problems. Out of the city their characteristics tend to work against them. Putting the rider in a very upright posture makes him or her become much more susceptible to the full effect of the wind, hindering forward progress and making the rider work much harder than it would be for someone riding a road bike. The flat handlebars limit one’s choices of hand position and make it difficult to lower the body to reduce wind resistance. The heavier frame, heavier wheels and wider tires all make the bike roll less efficiently, making these bikes slower and harder to pedal than a road bike. They are a compromise – great for in the city or on dirt paths but not very good on a highway or trip. How deep are your pockets? Bicycle prices range from $300.00 (entry level at a bike shop) to $10,000 (if you must have one of the finest machines available today). With bicycles you get exactly what you pay for. As the price goes up so does the quality of all the components. Manufacturers will sometimes put an inferior part on a bike to hold the price to a certain level but in general all the parts at a certain price-point will be standard for that amount of money and you’ll see little variance from one brand of bike to another. You should purchase your bike at a bicycle shop, not at a “Big Box” store. The price may seem a bit higher but it’s worth every penny. The bikeshop bike will have only quality parts that the shop is willing to repair and maintain. It will have been assembled by a professional mechanic, not by someone hired for a few months to slap together as many bikes as possible to meet the spring rush. The bike shop will welcome you back for many years, the department store will steer you to somebody else when something goes wrong or needs fixing up. The shop will be happy to help you with advice, will give you a trade-in if you choose to upgrade in a year or two, and will make you feel part of a very select group of people, namely those who ride a bicycle. At 2005 prices, I would say that around $700 is about entry level, where you might start looking. At this price point the components are all good and will last a few seasons. The frame quality is acceptable, the wheels, brakes and tires are reliable. A more serious bike will cost about $2,000 and weigh about 20 pounds, several pounds less than an entry level bike. It will have some carbon fibre parts, the gear train will be very smooth and be trouble free for several years. Bikes in this range are fine for most of us, they’ll give years of quality service and will carry us on every trip we want to take. Bikes costing more than this tend to become very specialized and lightweight. It’s said that every pound of weight saved on a bike costs $1,000 and you’ll find that’s pretty accurate. If you want to ride a 15 pound bike rather than a 20 pound one, you’ll have to pay for the privilege. Fourteen years ago I bought a touring bike when I joined EBTC, “just in case” I ever wanted to go on a fully loaded tour. I still have this bike but I’ve never gone on a fully loaded tour. I have since bought a sport bike and am much happier with it. Every case and every person is different, nobody can decide what’s best for you. Sometimes even your own choice may turn out to be wrong. Make a decision, stick with it for a year or two and then think it over again. All bikes are fun. They will bring you great pleasure, take you to places you’ve never been to and have you meeting people who are like-minded, energetic and interesting. I’m always open to questions and conversation regarding bikes. I can be reached at deploy@shaw.ca if you need clarification of any points or are still unsure of what bike might be best for you. Get out there and ride. Remember: NOBODY CAN PEDAL THE BIKE FOR YOU. Tires: Keep the Pressure Up, But Don’t Blow It! If you use your bicycle regularly, sooner or later you’ll find that you have to ride at night or in the rain. Though statistical studies show that it is more dangerous to ride under these conditions, they also show that the overall crash rate for bicyclists who ride regardless of weather is lower than that for bicyclists who ride only on fine days (see Jerrold Kaplan, “Characteristics of the Regular Adult Bicycle User,” Federal Highway Administration, 1975). Skill and correct equipment make it easy to ride with confidence. To ride at night, you need lights. Even when streetlights show you the way, you need lights so other people can see you against the glare of car headlights. Generally, bicycle lights are more important so people can see you than they are for you to see with. A white headlight identifies the fronts of all vehicles, bicycles too! All provinces and states require a bicycle to have a headlight at night. A red rear light is even more important, so motor vehicle drivers know you’re ahead. Three major types of lights are available for bicycles: small battery lights, generator systems and the high-powered battery systems. Choose your lights depending on where you ride. Small battery lights are most useful for riding under streetlights. Aim the headlight so its looks as bright as possible to people ahead of you. Nickel-cadmium rechargeable batteries will cut the cost of operating small battery lights. Most hardware stores sell these batteries and chargers for them. Small LED lights are inexpensive, light weight, and work well. Unlike small battery lights, a good generator system is bright enough to light your way on dark roads. It’s the best choice for long-distance touring, where you may not be able to buy or recharge batteries. Most generator systems go dark when you stop riding; a disadvantage in stop-and-go city riding. Some generator systems have a battery backup that keeps them lighted when you stop. High-powered battery lights are brightest of all. They’re best for night riding under demanding conditions: on dark roads or off-road. They’re much more expensive and slightly heavier than other bicycle lights, and need recharging regularly so the battery will last. When riding at night, carry spare bulbs and batteries for your lights. It’s also a good idea to carry a small battery light as a spare to get you home in case your main lighting system goes on the blink. a) To alert drivers, flash the headlight by twitching the handlebars. b) Mount a generator or high-powered battery light low, to cast the longest beam. c) Aim taillights and small battery headlights level. Test aim by rolling the bike toward and away from a wall. The center of the beam should stay at the same height. Don’t ride at night without a rear light or reflector (preferably both) and pedal reflectors are good too. Make sure that your reflectors aren’t obscured by baggage or dirt. Reflectors work well for drivers approaching from behind you; they continue to work if your taillight bulb has burned out, or if you’re stopped and your generator lights go out. The no-excuse headlight: A flashlight strapped to the handlebar stem with a bungee cord is legal, and sufficient for city use. It’s a good idea to use additional reflectors beyond those sold with a new bicycle. Most bicycle shops carry reflective legbands and vests. Adhesive-backed strips of reflective material are also sold for the bicycle frame and fenders. The rear reflector sold on new bicycles isn’t as bright as it could be; it has three panels to reflect to the left, right and center. A large automotive reflector is brighter directly behind you where it’s really needed. Be sure to aim your rear reflector directly back. If it’s tilted up or down, it may not work at all. Don’t consider front and side reflectors to be a substitute for a headlight. Pedestrians stepping off the sidewalk in front of you have no headlights and won’t see your reflectors. Motorists pulling out of side streets ahead of you also won’t see your reflectors, because these cars’ headlights throw their beam straight ahead — across the road in front of you. Test your nighttime equipment: Have someone ride your bike past you at night and check to see how well your systems work. Reflective clothing is a great idea, too. When riding at night, you can’t see drivers inside their cars to make eye contact, but you can flash your headlight at them by twitching the handlebars. Flash your headlight when you need to get the attention of a driver pulling out of a side street. In a few cities, the risk of theft and physical attack in dark, empty places like parks, pedestrian overpasses and industrial areas seems greater than the risk of crashes on streets with a reasonable amount of traffic, in residential areas and business districts. Choose routes accordingly – cars kill a lot more people than muggers, and quiet streets are safer at night. Rural riding at night is the most demanding of your equipment and technique. Most generator lights are not bright enough to allow you to ride downhill at full speed on an unlighted road. Stay within the limitations of your lights. Two-lane, shoulderless rural roads with moderate to heavy traffic have a bad record for nighttime bicycle crashes. On the other hand, quiet rural roads can be very pleasant to ride at night if your headlight is powerful enough to show you the way. And a full moon night in the countryside is glorious! At night there are generally fewer drivers on the roads; but of these drivers, a much larger percentage are drunk drivers. A useful trick on an unlighted road is to look at your shadow as a car approaches from behind. If the shadow moves to the right, the car is passing to your left. Riding in wet weather can be miserable, but if you equip yourself well, you can stay comfortable. Many bicyclists carry no wet-weather gear, and they get soaked. Some bicyclists try to use raingear borrowed from the coat rack at home. Long raincoats and ponchos can tangle with the spokes or frame. Rubberized rainsuits get as wet inside as out, because they don’t let perspiration evaporate – you’ll drown in your own sweat! A bicyclist’s rain cape is a fine solution, along with fenders on your bike. The raincape is like a poncho but tailored to fit you in your riding position on the bicycle. It’s small and light to carry, and relatively inexpensive to buy. It has loops at the front, which you can hook over your thumbs or the brake levers, extending front like a little tent. A waist strap holds down the back of the cape. The cape should be bright yellow, or even fluorescent, to make you more visible to drivers. The rain cape allows ventilation underneath, and so it’s the best solution on a warm, rainy day. But with the rain cape, you need a pair of full-length fenders on your bicycle. They keep dirty water and mud from flying up under your cape. A mudflap on the front fender or toeclip covers will keep your feet dry from spray kicked up by your front wheel. High-tech rainsuits of GoreTex or other materials that “breathe” can do the job too, especially when equipped with air holes to allow for cooling. Many have reflective strips to enhance your visibility, too. And they’re gradually getting cheaper and more easily available. MEC has some good ones that are very popular. Your riding technique needs some modification in wet weather. Rim brakes work poorly if the bicycle has steel rims — stopping distances may be increased by 10 times. High quality bikes usually have aluminum rims, which work somewhat better. It helps to wipe all rims dry by lightly applying the brakes in advance, well before you need to stop. There are several ways around the problem of wet-weather braking, among them special brake shoes, aluminum rims or a hub brake. One of these is advisable if you ride much in wet weather. Check with your bike shop about the best choice. In the rain, pay special attention to metal surfaces, such as manhole covers, painted traffic markings, wet leaves and oil slicks. They’re all especially slippery. Avoid riding through puddles if you can’t see the bottom — a puddle can hide a pothole. When you get home, it’s a good idea to relubricate your bike chain, to help prevent it from rust. Equip yourself, use reasonable caution and don’t let messy conditions keep you off your bike. Picture yourself on a city path. Suddenly, you notice that you’re about to ride down a flight of stairs. Or you’re riding on a country road and there’s a bridge out just a few feet in front of you. In cases like these, your bike’s brakes could save your life. But even if you don’t have such a dramatic experience, you’ll feel more confident and go faster if you’re ready to stop quickly and smoothly. It takes practice to get peak performance out of your brakes. You can’t just jam them on and skid to a stop as in a car. You’d fall off! Your brakes must be in good condition to give you the most control. Good bicycle brakes work powerfully and smoothly. If your brakes are weak or grabby, it’s time for an overhaul. But in addition to good brakes you need to understand weight transfer and how it affects your stopping. When you’re stopping — in a car, on a bike or on foot — your weight shifts to the front. You see examples of such momentum every day. When you’re running and stop suddenly, you have to put a foot out in front of yourself to keep from toppling forward. In the same way, when you stop a car, its front springs squeeze down as more weight goes to the front wheels. Your bike doesn’t have springs, but the weight nonetheless goes to the front wheel. Try a little experiment: Walk along next to your bike. Squeeze the front brake lever. The bike will stop quickly, but the rear wheel will rise off the ground. Then squeeze the rear brake lever. Braking will be weak, and the rear tire will skid. The same things happen when you’re riding. If you rely too heavily on the rear brake, the rear wheel will skid and wear out your back tire quickly. On the other hand, you can go right over the handlebars if you use the front brake too hard. How, then, do you get a powerful stop without risk? There’s a trick to learn. Use the rear brake as a signal to tell you how hard to apply the front brake. Practice on your bike in an empty parking lot. Squeeze the front lever three times as hard as the rear, while increasing force on both brake levers at the same time. With your light force on the rear brake lever, you’re braking the rear wheel only lightly. For a powerful stop, squeeze the brake levers harder and harder — the front always three times as hard as the rear. The rear wheel will eventually skid. But by this time, most of the weight will be off the rear wheel, so it will skid only lightly. You won’t wear a big bald spot in the rear tire — though you will feel and hear the skid. The rear wheel’s skidding is your signal to release the front brake a little. Once the rear wheel stops skidding, squeeze the front brake harder. Keep adjusting the force on the front brake lever to keep the rear wheel just below the point of skidding. This is your braking technique for straight-ahead stops on clean, dry pavement. Under these conditions, the front wheel will never skid, and you can keep the bike under control. You can train yourself to release the brakes whenever the bike begins to go out of control. Practice using your front brake so hard that the rear wheel actually lifts off the ground. It’s less scary to do this on soft grass. At a very low speed, 2 or 3 miles per hour, grab the front brake lever so hard that the rear wheel lifts off. Then release the brake lever instantly. Wear your helmet! Braking technique is different when the road surface is slippery, or if you’re turning. Under these conditions, the front wheel can skid. You must brake lightly and use the front brake less. Avoid turning and braking on a slippery surface. If your front wheel skids out, you’ll fall. On pavement that is good except for a few places, look ahead for the slippery spots and bumps. Release the brakes as you go over the bad spots, then increase force again once you’re back on good pavement. On dirt, gravel or any surface that looks as though it might be slippery, test the surface by applying the rear brake lightly. If the rear wheel skids easily, avoid using the front brake. Keep your speed down so that, even with your reduced braking power, you can still stop. In wet weather, the streets will be more slippery and so will your rims. This is especially important when it first begins raining – raindrops mix with the old oil and dust on the road, making a thin greasy mud on the pavement. After it rains a while, this slippery “grease”is washed away, making the road much safer. Dry the rims by applying the brakes lightly ahead of time. They will squeeze the water off your rims. It can take 100 feet or more before the brakes begin to work normally. When turning, you may have a choice to swerve out of danger or stop — but don’t try to do both at once. Practice braking on turns and slippery surfaces to get a feel for these conditions. Your training will pay off as you become more confident on the bike, in all types of riding situations. You never know when you might have to stop — and the better you can stop, the more confidently you go. A bicycle is a highly maneuverable machine, but that maneuverability makes it quite tippable. You have to take extra care to stay upright and read the road for the special hazards that can cause a bike to fall. Beware of any slippery or loose surface: gravel, snow, ice, leaves, oil patches, wet manhole covers and crosswalk markings. Avoid these, or ride over them slowly. Don’t turn, brake or accelerate. Be ready to put a foot down for balance. Beware of any slippery or loose surface: gravel, snow, ice, leaves, oil patches, wet manhole covers and crosswalk markings. Avoid these, or ride over them slowly. Don’t turn, brake or accelerate, just glide ahead straight and smooth and you’ll be fine. Be ready to put a foot down for balance. Be especially careful of diagonal railroad crossings, trolley tracks, a row of raised lane-line dots or a step between the shoulder and the travel lane. Any of them can push your front wheel to the side and sweep your bike out from under you. When you can’t avoid them, cross them as nearly as possible at right angles. Check behind yourself for traffic, then cross a diagonal railroad crossing at a right angle. Beware of steel-grid bridge decks, which, especially when wet, will steer your bike parallel to the gridding, making balancing difficult. Test a grid deck at a low speed, and walk or use the bridge sidewalk if necessary. Any bump, rock or pothole more than an inch high can squash your bicycle’s tires flat against the rims, damaging the wheels. Avoid the bumps if you can, and walk your bike if the going gets too rough. Avoid a rock by turning the handlebars to one side; then correct your balance by turning them the other way. Now for the good news: Thanks to your bicycle’s small size and quick steering, you can prepare yourself for situations like this one. It’s a pleasant, two-lane country road, just wide enough for cars to pass you in your lane. You look up at the scenery and then down at the road. There’s a rock directly in front of you. And there’s a car just behind you. You can’t swerve left into the traffic and you don’t want to swerve to the right, into the gravel and dirt. What to do? Make your wheels weave around the rock while riding in a straight line — the rock-dodge maneuver. Just as you reach the rock, steer quickly left, then right to correct your balance, then straight again. Because you correct the balance quickly, your body doesn’t have time to follow the bike’s weave. You continue nearly in a straight line. To give yourself better odds against rocks and potholes, go to an empty parking lot and practice the “rock dodge” until it becomes easy. In order to turn sharply to the right, twitch your handlebars to the left first, to start your lean to the right. Picture yourself in another pinch: You’re riding along a street, approaching an intersection, and a car on your left suddenly begins a right turn. The side of the car is headed straight for you! You have to turn quickly alongside the car to get out of trouble. To begin a turn quickly, you have to lean your bike over quickly. But how do you maneuver? Your bicycle balances the same way you balance a yardstick on the palm of your hand. If you want to move the yardstick to the right, you move your hand to the left. Then, the yardstick leans to the right, and you follow it with your hand. Just the same way, if you steer your bicycle out from under you to the left for a moment, then you lean right and can turn to the right. You must first steer momentarily toward the car you’re trying to avoid. This is called “counter-steering.” Try this technique in your parking-lot practice area. At slow speeds at first, twitch the handlebars quickly to the left. Your bicycle will lean to the right, and then you can steer right. Practice first at slow speeds, then at faster ones. The faster you go, the less sharply you have to steer. The instant turn is useful in many situations. If a car coming toward you begins a left turn, turn right into the side street with it. If a car pulls out of a side street from the right, swerve into the side street. It’s best to turn to the right, behind the car — but if it’s too late for that, turn left with the car. Even if you hit the car, the nearer you’re going in the same direction, the lighter the impact. If you’re going around a curve too fast, straighten the handlebars momentarily to drop into a deeper lean, and a tighter curve. Sooner or later, you may find yourself going around a downhill curve too fast. A variation on the instant turn can get you through this situation in one piece. The usual, panic reaction is to steer straight and brake. Don’t brake – then you’re likely to go headfirst off the road before you can stop. Straighten the handlebars momentarily, as in the instant turn, to drop your bike into a deeper lean. You’ll make it around the curve – your tires have much more traction than you normally use. Tour de France racers use tires even thinner than yours, and even that skinny rubber will grip on mountain curves at 90+ km/h! Your tires will hold, no question. If you do skid out, you’ll fall on your side and slide to a stop. If you’re about to ride into a wall or over a cliff, you may decide to deliberately skid out. Lean into a turn, then hit the brakes. The fall may hurt — but not as much as the alternative. There is a pothole straight ahead, and no time for even a rock dodge. You were so busy looking up at the traffic that you didn’t see the pothole ahead, and now you’re about to trash your wheels. If only you could fly . . . Jumping is the quickest last-resort way to avoid a pothole or other road-surface hazard. Once you get good at it, you can even use it to climb low curbs or to cross diagonal railroad tracks. In your empty parking lot, practice jumping your bike. You must lift the front wheel, then the rear wheel as it takes its turn with the bump. Your timing depends on how fast you’re riding. Once you know your emergency maneuvers, you’ll gain a much expanded sense of security, confidence and style. You’ll be able to “ride loose,” to use the language of California all-terrain riders. It’s a sign of an experienced rider, and it saves you and your bike a lot of wear and tear. Not all intersections are of the standard, “crossroads” type. Though the same principles of lane positioning apply to all intersection maneuvers, some situations can be confusing and deserve a second look. Bicyclists sometimes will ride against traffic or take unusual routes across intersections to get to their lane positions. Don’t do it! Instead, look for a good place to enter, where you can start out with a normal intersection maneuver: a left or right turn, or a lane change to merge into traffic. The traffic laws apply as soon as you’re on the road, and even if you have to walk your bike half a block to a driveway, a legal start is much safer. Besides, you often get started faster, since you can then move with the normal flow of traffic. When entering the road from a narrow driveway, ride down its middle. A pedestrian could be approaching on the sidewalk from either side, and a car could be about to enter the driveway from either direction. By placing yourself in the middle, you can see in both directions equally well. When entering the road, look left, but always look right as well for pedestrians and overtaking cars. Even when preparing for a right turn onto a rural highway, look left, right, left, and then right again. A car approaching from your right can pull out to pass very quickly and head for you in the lane you’re about to enter. Traffic follows the usual rules at a diagonal intersection, but it’s harder for drivers to look into the diagonal cross street behind them. Be especially careful of vans and trucks, which have a right rear blindspot. Some of the turns in a diagonal intersection aren’t very sharp, so cars may not slow down very much. Be alert to oncoming left-turning traffic, and be sure the drivers have seen you. When you’re riding along a road and an on-ramp comes in from the right, stay in your normal lane position. Traffic from behind you on the ramp will first pass to your right, and then to your left. An off-ramp is much like a right-turn lane, except that the traffic is faster. If you’re going straight and the ramp goes off to the right, stay in your normal traffic position, to its left. The exiting traffic will pass you on your right, and the through traffic to pass you on your left. When you’re passing an off-ramp, exiting drivers may hesitate to pass you on the right. It’s effective to stay a little farther to the left than usual and make a left-turn signal. Drivers can see your hand signal for hundreds of feet behind you, so it’s useful even when cars are traveling at highway speed. A one-way roadway can have on- and off-ramps to the left side. When entering on a ramp from the left, ride along its left side, then the left side of the roadway until you can cross to your normal lane position. When exiting on a ramp to the left, cross to the left before the ramp and ride on the left side of the ramp. Sometimes two roadways will join or divide, but the total number of lanes will stay the same: For example, a couple of one-lane roads can join into a single two-lane one-way road. In high-speed traffic, it’s best to ride along the edge, as with ramps. When entering or exiting from the left in slower traffic, you may ride on the right side of the left road, so you avoid having to cross as many lanes. A traffic circle is a left-curving street with several side streets going off to the right. The right lane of a traffic circle, then, is a right-turn lane used by entering and exiting traffic. Enter the traffic circle in the right lane if you’re going to turn right at the first exit. But if you’re going past the first exit, change lanes to the inside as you enter the circle. Ride around at the outer edge of the inside lane. It sometimes helps to make a left-turn signal while in the inside lane; drivers then feel comfortable about passing you on the right as they exit the circle. Change back to the outside lane as you approach your exit. Use your normal tactics and hand signals for lane-changing. In a traffic circle or rotary intersection, a) Keep to the right if you will take the first exit, b) and c), Ride in the inside lane if you are going past the first exit. Because of the traffic circle’s left curve, cars go straight to turn right. For this reason, it’s especially dangerous to cross an exit of a traffic circle in the right lane. Bicyclists who always keep to the right will tell you that traffic circles are very dangerous. On the other hand, you’ll find it surprisingly easy to ride around in the inside (left) lane. Drivers don’t go very fast there, since they follow the curve. Sometimes you need to make two left turns quickly, one after the other; for example, if you’re turning left at an intersection and then turning left into a driveway at the middle of the block. In this case, don’t head for the right side of the street after the first left turn. You may not have time to change lanes to the left again. Finish your first left turn in the correct lane to begin your second left turn. If a one-way street is two or more lanes wide, laws in most states allow you to ride at either side. When you make a left turn from a one-way street onto another one-way street, it’s easiest to ride around the corner on the left. And there they are — the difficult intersection types. Once you can handle these, you can ride just about anywhere. You can even figure out how to handle intersections not described here by using the principles of lane changing and positioning on which all intersection maneuvers are based. Intersections are where all of your traffic-riding skills come together. If you ride smoothly through the intersections, you can handle almost any riding environment. At intersections, move to the correct lane position depending on which way you’ll be going. Often, you’ll need to move away from your normal position near the right side of the road. If you’re turning right, keep to the right. But if you’re turning left, move to the center of the road. If you’re going straight, go between the right- and left-turning traffic. Right turns are easiest. Just stay in the right lane, look around for traffic and go around the corner. To avoid being squeezed against the curb, ride in the middle of the right lane if it’s narrow, just as you would on a straightaway. Remember that the rear end of a car pulls to the right as it makes a right turn. At a stop sign or legal right turn on red, yield to traffic coming from the left on the cross street. You’re always required to yield to pedestrians in crosswalks. Bicyclists follow the same set of rules as drivers do. A right-turn signal is a useful courtesy to drivers who would have to wait for you if you were going straight. Make your right-turn signal by pointing with your right arm. The “bent left arm” signal for turning right is not recommended. Pointing your left arm left for a left turn, and your right arm right for a right turn makes a lot more sense, and is easier for motorists to understand. The only reason people are taught the “bent left arm for a right turn” signal is that IN A CAR you can’t signal with your right arm – it’s inside the car, steering. So CAR drivers must use their left arm out the window, and bend it to point right. Cyclists don’t have that confusing problem. Just point to the right with your right arm! To prepare for most intersection maneuvers, you need to change your lane position. Even between intersections or when making a right turn, as just described, you may have to move farther into the right lane. So far, we’ve gotten by with a quick description of how to look back and check for traffic. But when making a left turn, you often have to move across more than one lane. It’s time to go into more detail. Before you change your lane position, you must always look back for traffic. Your sense of balance is in your head, so you need some practice to turn your head without swerving. Some bicyclists change lane position without looking back, because they’re afraid of swerving. Don’t trust your ears! Many cars are very quiet, and a bicyclist behind you is quieter. In an empty parking-lot practice area, ride along a straight, painted line. Turn your head to glance back, and then look forward again to see whether you’re still riding straight. To keep from swerving, think about the position of your arms. If you don’t turn the handlebars, you won’t swerve. Turn your head to look, even if you have a rear-view mirror. A mirror can help you to keep track of the traffic directly behind you, but no mirror will show cars or bicyclists at your side. The best way to look back depends on your riding position. If you’re sitting upright, swivel your neck and your back. If you’re in a low crouch, duck your head sideways. Some bicyclists look over their shoulders and some even duck their heads underneath their arms. So now you’ve looked back. What next? If there’s a car close behind you, let that car go by, and deal with the next car. Usually, the next driver will have time to react to your signals. If you make your intentions clear, the driver will almost always let you into line. Extend your left arm to signal that you want to move to the left. Wait a couple of seconds, then look back again to check that the driver has slowed down or moved aside to make room. Turning your head to look back is a signal, too. In slow, crowded traffic, you need to keep your hands on the handlebars, ready to brake. You can usually move into line with the cars while signaling only with a turn of the head. Whatever signal you use, always make sure that the driver behind you has noticed your signal and made room for you. Cross a lane in two steps; one to cross the lane line and the next to cross to the other side of the lane. Do not change your lane position until you’re sure that the driver has made room for you. Most drivers will, but there’s no guarantee. Your signal doesn’t make it safe to change lane position. Only the driver’s response to your signal makes you safe. If you begin your lane change early enough to deal with two drivers, you’ll almost always succeed; if the first one doesn’t make room for you, the second one almost certainly will. So anticipate turns and plan for them in time. In high-speed highway traffic, drivers may not have time to react to you. Then you need to wait for a gap in the traffic and move across all of the lanes at once. To prepare a left turn, change lanes until you reach the left-turn position in traffic. As you move toward the center of the street, this is where no cars on your left will go straight ahead. If the lane carrying left-turning traffic also carries through traffic, ride at its left side. If it’s a left-turn-only lane, ride at its right side. On an ordinary two-lane street, turn left from just to the right of the centerline. It may seem dangerous to move to the middle of the street, but in fact, the middle is the best position for a left turn. When you’re in the correct position, all the traffic you have to deal with is in front of you. Since you’re to the left of the through traffic coming from behind you, you don’t have to look back while making your left turn. You can concentrate on the traffic from the left, right and front. You may have to cross more than one lane to reach the left-turn position. Cross each lane in two steps. With one step, cross the lane line so you’re just inside the next lane. With the next step, cross to the far side of the lane. At each step, look back and, get a driver to make room for you. Yield to traffic from the left, right and straight ahead; so you don’t have to come to a stop, you may move slowly out to the middle of the intersection, the same way cars do. Then you can get moving faster when there’s a gap in the traffic. Pass an oncoming left-turning car right side to right side. When turning left from the left side of a lane, don’t let left-turning cars behind you pass you on the right. While waiting, keep near the middle or make a slow signal with your right hand. As you enter the intersection, ride straight ahead for a few feet so the left-turning cars behind you can pull to your left. Correct paths for left turns. a) The bicyclist has turned left from the right middle of a narrow left turn lane. b) The bicyclist has turned left from the left middle of a narrow left-and-through lane. Wait for a traffic light at the middle of such a lane unless you know which way the car behind you is going. c) The cyclist turns from near the center of a two-lane street and enters the inner lane of a four-lane street to avoid the right-turning car entering the outer lane. If you don’t make it to the left-turn position by the time you reach the intersection, go straight through the intersection. Make your left turn at the next intersection, or cross to the other side of the street, double back and make a right turn. It’s also okay to make a left turn as a pedestrian. This way, you can turn left legally at a “no left turn” sign or handle traffic situations you feel are beyond your abilities. Be sure to come to a complete stop when you reach the far right corner of the intersection. At this point, you have to look for traffic from all four directions at once; there’s no safe way to do so while you keep moving. Going straight through an intersection is easy compared with a left turn. You may have to change lanes, but not usually as many. When going straight through, make sure right-turning traffic passes you on your right. Stay completely out of a right-turn-only lane. If there’s a lane marked for right turns and through traffic, ride near its left side. You may have to move into the second or third lane from the curb to avoid the right-turning traffic. Keep to the left of right-turning traffic when going straight through an intersection. Do not go to the right of traffic unless you are turning right. When you approach an intersection where cars are waiting for a stop sign or traffic light, never pass the first car. You never know for sure when or in which direction that car will move. Besides, while you’re passing the car, it may hide a pedestrian or other hazard. The most difficult intersection to ride straight through is the one that looks simplest — on a small, two-lane street. Traffic in the right lane goes in three different directions — right, straight and left! Still, on a street with parallel parking, the empty space between the parked cars and the corner serves as a right-turn lane. Don’t wander right, into this space. Keep going straight ahead. On a street without parking, pull a little farther into the lane to discourage right-turning drivers from passing you on the left. With a little finesse, you can position yourself just far enough from the curb so cars can pass you on the right to make a legal right turn on red. Some motorists hesitate to pass between a bicyclist and the curb even to make a right turn. Wave them by with your right hand. We’ve all seen bicyclists who wander from left side to right, who go from the sidewalk to the street an who weave in and out between parked cars. From moment to moment, nobody can tell what these bicyclists are about to do. Pedestrians jump back, and car brakes squeal as such bicyclists approach. On the other hand, we’ve seen bicyclists who seem to blend into the traffic flow smoothly and effortlessly. You always know where they are headed and what to do around them, whether you’re on a bicycle, in a car or on foot. They make bicycling look easy — but aren’t they taking a risk? Isn’t it safer to avoid the traffic as much as possible? Intersection collisions are the most common type caused by wrong-way riding. The motorist in the side street is looking left, where the traffic normally comes from. With very few exceptions, the safest way to ride is as part of the traffic, going with the flow of the normal traffic pattern. Bicyclists who ride this way get where they’re going faster and, according to scientific crash studies, have about five times fewer crashes than bicyclists who make up their own rules. (J. Forester; Effective Cycling. Cambridge, MA, MIT Press, 1985). Generally, the more you follow the normal traffic pattern, the safer and more predictable you become. The rules of the road set up a pattern for every situation, telling which driver has to wait. Sometimes you have to wait for other drivers — for example, at a stop sign — but sometimes they have to wait for you. In this way, the rules of the road protect you by making it clear what you’re going to do next. Some bicyclists think they’re safer on the left, where they can see traffic coming, but riding on the left is actually one of the biggest causes of car-bike crashes. If you ride in violation of the traffic laws, you greatly increase your risk of a crash. This includes bike paths, which are governed by the same rules! You also may give up all of your rights. If you get into a crash, the courts will almost always find that it was your fault! If you ride on the left, both you and oncoming traffic must come to a complete stop to avoid head-on collisions. When you ride on the right, drivers behind you only have to slow to your speed — and they have three times as long to react. Also, drivers and pedestrians about to pull out from side streets and crosswalks will be looking toward you — in the direction traffic normally comes from. Rule-breaking cyclists understandably irritate drivers who are responsibly following the rules of the road. They may be scared or angered by your behavior, and feel like “returning the favour” and treat the next cyclists they see poorly. Don’t make things bad for everyone! WHERE IS THE ROAD EDGE? Normally, slower traffic keeps to the right, and faster traffic passes on the left. Since your bicycle is usually slower than other traffic, you usually ride near the right edge of the road. But how far to the right? Generally, the usable width of the road begins where you can ride without increased danger of falls, jolts or blowouts. A road may have a gravel shoulder, its edge may be covered with sand or trash or the pavement may be broken. Don’t ride there. Closer to the center, there’s better pavement, which is swept clean of sand and debris by the passing cars. The right side of the road begins here. 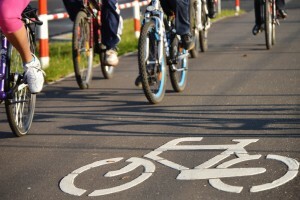 Most bicycle crashes are simple falls or are caused by hazards in front of you. Train your eyes to scan the scene ahead, and look for blindspots. Keep your eyes moving — you have to look up at the traffic and also down at the road for potholes and cracks. Ride far enough into the lane to avoid the risk from blindspots. If you ride too close to parked cars on your right you can’t see around them into side streets and driveways. A pedestrian, car or bike could come out from between the parked cars. Drivers in side streets might pull their cars out into your street to look right and left. And the door of a parked car could open in front of you. Glance into the rear window of any car you’re passing, and in it’s side mirror. If you see a person, they may be ready to open their door! Where there are parked cars, the usable width of the street begins about 3 feet out from them — or from a wall, hedge or other obstruction. As you approach a blind intersection or driveway, you should be even farther from the edge of the road — imagine a car hood poking out. Don’t ride in the danger zone! By riding a safe distance from roadside hazard, you increase your safety. At a), the motorist in the driveway sees you; at b), the motorist overtaking you will not take the easy way out and skim by your elbow; at c), the car door is no threat; and at d), the motorist behind can see you. Don’t weave in and out between parked cars. If you weave to the right after passing a parked car, it will hide you from drivers approaching from behind you. Then you have to pop back out when you reach the next parked car. Put yourself in the place of a driver a couple of hundred feet behind you. Could this driver see you? Don’t weave between parked cars, where you become invisible to overtaking drivers. Sure, many people — even some bicycling “experts” — will tell you, “Always keep as far to the right as possible,” and, “Look out for opening car doors.” But at speeds above 5 miles per hour, you can’t stop in time to avoid a car door. Your only choice is to swerve out into the street — maybe into the path of a passing car. It’s much safer to ride in a predictable, straight line, where everyone can see you. Motorists won’t mind slowing down for a predictable, visible bicyclist nearly as much as they mind a bicyclist who swerves out in front of them. If the road has a paved shoulder or an extra-wide right lane, don’t ride all the way over at the right edge. Instead, keep riding in a straight line 2 or 4 feet to the right of the cars. Stay at a steady distance from the left side of the right lane. If you stay all the way over at the right edge of the shoulder, you’re much more likely to be cut off by a right-turning car — and when this happens, it’s harder for you to avoid a crash. By the time you see the car, it will be blocking your path. If you’re closer to the car, you can turn with it and avoid a crash. In a wide lane, you are safer if you stay just to the right of the cars. In a), you can turn to avoid a crash. In b), the car is across your path before you see it. There’s only one important exception to this rule: in most (not all) places, it’s legal for bicyclists to ride on high-speed limited-access highways. Here, you can ride at the right side of the shoulder, avoiding the wind blast from big trucks. Except at the rare on- and off-ramps, limited-access highways have no cross traffic, so there’s no problem with turning cars or pedestrians. In a wide lane, there’s room for cars to pass you. But in a narrow lane, cars have to move part way into the next lane to pass you. Narrow lanes are common on city streets and on backroads in the country. On a narrow two-lane, two-way road stay alert to strings of cars from the front, in case one pulls into your lane to pass. You can ride near the edge of this type of road if cars are coming from only one direction at a time. Then cars from the rear can pass you without having to move as far into the other lane. On a two-lane highway, be alert to drivers ahead of you pulling out to pass, especially if the lanes are narrow. Passing when there’s oncoming traffic (you!) is illegal, but happens often, and can be deadly. If you can get the licence and report it, do so. But if cars are coming from both directions, you have to take control of the situation. You can’t take chances that the drivers behind you will try to pass you in oncoming traffic. Glance behind you, and if there’s traffic there too, take the first opportunity to merge safely to the middle of the right lane. Also merge to the middle of the right lane at a blind curve where there might be oncoming traffic. On a right curve in a narrow lane, this technique makes you visible earlier to the drivers behind you. The driver behind you will have to slow and follow you. It helps to make a “slow” signal (left arm extended downward) to indicate that you’re aware of the car behind you and that it’s unsafe to pass. Don’t let an impatient driver cause a crash. On a multi-lane road with narrow lane, a), ride in the middle of the right lane. You are likely to get squeezed out, b), if you hug the edge. Understand that the law is on your side. The law gives you the right to use the road, the same as any other vehicle, and to make other traffic slow down for you sometimes. Since you don’t have eyes in the back of your head, you can’t be expected to keep track of the traffic behind you at all times. The driver approaching from the rear is always required to slow and follow if it’s not possible to pass safely. It may seem dangerous to make a motorist slow for you, but it’s not. The usual reason that bicyclists feel unsafe on narrow roads is that they do not take control of the situation. Remember, the drivers behind you don’t have room to pass you safely anyway. If you ride all the way over at the right, you’re inviting them to pass you where the road is too narrow and, too often, you will get squeezed off the road. If you show clearly that it’s not safe for drivers to pass you, they’re unlikely to try. In any case, narrow roads aren’t usually places where motorists drive very fast. It’s dangerous to drive fast on narrow roads because there’s so little room for error. Motorists expect to have to slow down for all sorts of reasons, including slower vehicles ahead of them – you, the cyclist. But be courteous…you have every right to the road, but don’t hog it. When it becomes safe for the car behind you to pass you, give the driver a wave-by signal. Like all slow vehicles, if you block traffic for more than a short time, the law requires you to pull to the side from time to time and let the traffic by. On a road with two or more narrow lanes in your direction — like many city streets — you should ride in the middle of the right lane at all times. You need to send the message to drivers to move to the passing lane to pass you. If you ride all the way to the right, two cars may pass you at the same time, side by side, and squeeze you off the road. Usually, cars travel faster than bicycles. But not always. A row of cars may have slowed in a traffic jam. Or you may be riding down a hill where you can keep up with the cars. If you’re going as fast as the cars, pull into line with them, like a motorcycle does. When riding down a hill at high speed, you need more room to steer and brake. Besides, it’s dangerous to ride along next to the right side of a car. The driver could turn right or edge closer to the curb without ever seeing you. As long as you keep up with the car in front of you, stay in line with it. If you begin to fall behind, pull to the right. But if you’re catching up with the car, pass on the left, just as if you were driving a car yourself. When going as fast as the cars, you’re much safer if you ride in the middle of the traffic lane. In a), the driver behind you can see you. In b), the driver next to you has not seen you and could turn right. The safest position in traffic doesn’t depend on whether you’re riding a bicycle or driving a car. It depends on how fast you’re going and where you’re headed. Drivers expect to be passed on the left, so they look back to the left before they pull out. Before you pass, look back for traffic to make sure that you can pull safely into the passing lane. Keep your distance from the side of the car you’re passing. Don’t sneak along next to it. Put yourself where the driver will look for you. If you’re passing a big truck or bus, give it even more clearance — 5 or 6 feet — since it could move farther before you could get out of its way. When you’re finished, move back into the right lane. Sometimes the car, bus or truck you’re passing will pick up speed while you’re still next to it. Then just keep the same position in the lane, and brake lightly if necessary to fall back. When you’ve fallen behind, look back to the right for traffic, then merge back to your normal position in the right lane. On a street with multiple right-turn lanes or heavy, slow traffic, you may move left more than one lane to pass slower traffic. Just like a motorcycle or any other faster vehicle. Your correct position on the road follows a sensible set of rules, the same as for a car driver: Keep to the right if you’re going slowly, but pull to the left to pass. The way you carry out these rules is just a little different – as explained here – since your bicycle is narrow and usually slow. An understanding of road positioning makes the difference between the rider who “weaves and wanders” and the one who blends smoothly and SAFELY into the traffic flow.